xv, 210 leaves. : illus. ; 28 cm. writing of this dissertation. The committee was composed of Dr. J. D.
Butterworth, Chairman; Dr. Frank Goodwin, Dr. R. H. Blodgett, Dr. C. A.
to conduct without their support. Per Cent Disbribution by Region . .
Undesired Patients, in Percentages ........ 99.
for services in the post World War II economy of the United States. Workers," The Wall Street Journal, December 9, 1963, p. 1. Big Rise," The Wall Street Journal, October 24, 1963, p. 1. 3"Spending More On Luxuries," Business Week (May 23, 1964), p. 25.
tions to inflationary pressures resulting from such spending. goods" services, utilities, rents, and transportation fares. of higher costs of services, particularly housing and medical care. Ill.: Richard D. Irwin, Inc., 1958), pp. 60-61.
in Pricing of Services," Business Horizons, Summer 1961, pp. 93-94. Street Journal, December 2, 1963, p. 7.
as the primary source of consumer satisfaction. group concentrated their efforts on the marketing of physical goods. three pages to the marketing of business and personal services. E. J. Publishing Company, Inc., 1961), pp. 292-294.
hard goods and soft goods, or durable goods and non-durable goods. time of consumption, and searching time. wood, Ill.: Richard D. Irwin, Inc., 1960), p. 46. 11Leo V. Aspinwall, "The Characteristics of Goods Theory,"
which the individual attributes a power to satisfy some want or other. that is, things which satisfy human wants directly or indirectly . .
and Company, Inc., 1955), p. 24. The McMillan Company, 1948), p. 54.
tangible goods can also be employed in the study of intangible goods. ing a new theory, but by expanding the application of existing thought. the various classifications of goods which marketers have employed. 15E. J. McCarthy, op. cit. Houghton Mifflin Company, 1921), author's preface. facts of economic life can be reduced to manageable proportions. can be applied, completely or partially, to intangible goods. 17William Regan and Cornelis Visser, "The Elusive Service Market,"
order to purchase these articles and to buy without shopping. are many services which may readily be classified as "shopping"
establishments before finally deciding where to patronize regularly. may obtain several estimates before having his car painted or repaired. of Retailing (New York: McGraw-Hill Book Company, Inc., 1956), p. 49.
professional person is very important. The scope of this dissertation has now been partially defined. number and important enough largely to dominate the situation. 20Frank Knight, op. cit., pp. 3-4.
be the specific subject of study. sists of several categories, one of which is professional services. particular, will be the specific subject of study. keting of legal services or some other selected professional service. tions which were presented in the previous sections. fession in Florida will be analyzed from a marketing point of view. available, but original research will be directed at Florida dentists. regarding the marketing of selected professional services. ducted for the Florida Academy of Dental Practice Administration. manufactured goods. This point is discussed in Chapter III. dentists to segment their markets will be covered in Chapter IV. strategy, namely the establishing of market targets or objectives. (Cambridge: Harvard University Press, 1948), p. 56.
period there is little opportunity for a seller to improve his position. mainly with the intermediate and long run periods. quantity of service products to be supplied. hygienists, assistants, secretaries, and technicians could be hired. dental treatment especially if one is suffering with a tooth ache. products are said to be differentiated. pure competitors according to economic theory, but, to use E. H.
in question, a critical examination of this assumption is in order. wood, Illinois: Richard D. Irwin, Inc., 1957), po 102. 6th ed. (Cambridge: Harvard University Press, 1948). and Brothers, 1955), p. 182.
stration. A description of this survey is contained in the Appendix. and nonmonetary costs incurred by the dentist. mize his total income which consists of money and psychic income. nervous strain experienced by a dentist varies from patient to patient. is perfectly consistent with the principle of income maximization. The MacMillan Company, 1952), p. 106.
into the marketing activities of dental firms. net incomes of $30,000 or more. of 79 per cent for dentists in the $30,000 or higher group. profession and future members as well. activities since a seller cannot assume or take his market for granted. parts: First, the market target or objectives must be defined. 7Wroe Alderson, op. cit., p. 102.
ed. (Cambridge: Harvard University Press, 1948), pp. 71-72.
appeal to the selected market segment or segments. velopment of the strategy involves a method of attack. 9Brian Dixon, op. cit., p. 102. Richard D. Irwin, Inc., 1960), p. 7.
quirements of the market target. 14Brian Dixon, op. cit., p. 17.
price, place, and promotion differentiation. subject matter of this dissertation. 15Kenneth Boulding, op. cit., p. 633.
and Market Segmentation as Alternative Marketing Strategies,"
Managerial Marketing: Perspectives and Vi~woints, ed. Eugene J.
another; the only form of competition that prevails is one of price. York: Oxford University Press, 1957), p. 114.
teristics of dental services will also be studied. good, variations in price within a given market are to be expected. ed. (Cambridge: Harvard University Press, 1948), p. 82.
services is a subject that will be discussed in Chapter V.
20Brian Dixon, op. cit., p. 36.
profession, there are several public relations and "patient education"
activities conducted by dentists which are promotional in nature. wood, Illinois: Richard D. Irwin, Inc., 1960), pp. 490-492.
ed. (Cambridge: Harvard University Press, 1948), p. 62. (New York: Oxford Univeristy Press, 1957), p. 128. (February 1, 1964), pp. 50-51.
in sales less than proportionate to the increased expenditures. The Brookings Institution, 1961), p. 216. 27Brian Dixon, op. cit., p. 42.
are taken as given or assumed with the only variable being price. ed. (Cambridge: Harvard University Press, 1948), pp. 131-132.
along curve DI is a measure of the degree of promotional elasticity. tional effort OP the quantity sold would increase from OQ1 to OQ2. in the marketing mix constant. 29Brian Dixon, op. cit., p. 17.
quantity OQ2 would be sold at place OP. filling and each unit of promotional effort costs $15. as reductions in revenue in studying the problem of optimn choice. gross revenue in the analysis of elasticity of nonprice elements. 50Kenneth Boulding, op. cit., pp. 772-784.
elasticity where net revenue reached a maximum of $25. type of positive sloping demand curve as does the element of promotion. demonstrated for these nonprice elements as it was for promotion. with the theory as presented. American Council on Education, 1961), p. 13.
for the Dentist (New York: American Cancer Society, Inc., 1962), p. 111. 8Byron S. Hollinshead, op. cit., p. 19.
tail later in this chapter. of the total population visited a dentist in the course of a year. 62," Social Security Bulletin, XXVI, No. 12 (Washington: U. S.
Government Printing Office, December 1963), pp. 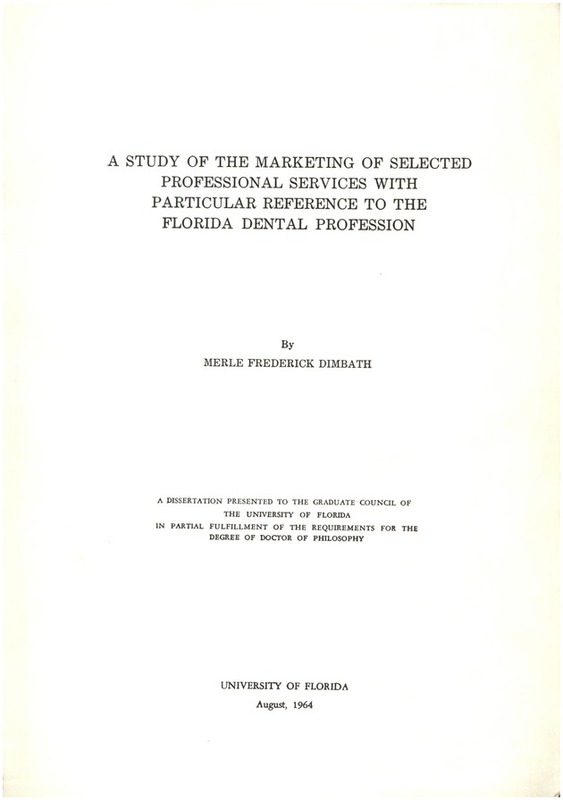 4-7.
ness Research, University of Florida, May 1963), p. 24.
the characteristics and motivations of the consumers of dental care. years have passed since their last visit to a dentist. Females appear to take better care of their teeth than do males. female population who have never visited a dentist. ahead of the men, percentage-wise. B, No. 15 (Washington: U. S. Government Printing Office, 1960), p. 15.
of dental service products than are males. average with 2.1 visits per person. South has the lowest level of consumption. dentist during this same time. services than do residents in rural communities. families with incomes of $7,000 or more. Table 11, that the national average is 1.5 visits per person per year. B, No. 15 (Washington: U. S. Government Printing Office, 1960), p. 17.
this group have been to their dentist within the past six months. flected in their frequency of dental visits as shown in Table 20.
young or the very old. cent distribution of dental visits by type of service and by age. TYPE OF SERVICE AGE g... .
B, No. 15 (Washington: U. S. Government Printing Office, 1960), p. 24.
work is the main purpose accounting for 34.5 per cent of the visits. dental services which a person will buy during a particular age. terrents to greater consumption of dental care. A study of the St.
Louis Labor Health Institute was made by the Public Health Service. Why is it that people do not go to the dentist more often? (Washington: American Council on Education, 1961), p. 27. (Washington: American Council on Education, 1961), p. 28.
cent just do not like to go to the dentist. services, attention has been directed mainly at the national situation. the problem of patient turnover using the data presented in Table 24.
that they had been going to their present dentist for only two years. years is 43 per cent. Dental Patients' Attitudes (Gainesville: Florida Surveys, 1963), p. 25.
patients had been going to the same dentist for over 10 years. examine how a patient selects a dentist. Patients' Attitudes (Gainesville: Florida Surveys, 1963), p. 26.
this as a reason with 24 per cent stating this as their main reason. purchase of dental care in Florida. 18Theodore N. Beciman, Hearold R. Maynard, and William R. Davidson. 19F. Goodwin, R. Stanley, and K. F. Diubath, 09. C~t.0 p. 30. Dental Patients' Attitude* (Gainesville: Florida Surveys, 1963), p. 28.
little pain as more important in patronage considerations than do men. relatives than is the case for older patients. patients find it desirable to change dentists. Dental Patients' Attitudes (Gainesville: Florida Surveys, 1963), p. 40.
due to factors other than unsatisfactory buyer-seller relationships. dentists in Florida to strengthen their competitive position. left their last dentist and for 2 per cent this was the main factor. portant in the dental marketing mix. most important factor with 70 per cent indicating this as a reason. little pain" was shown to be a patronage motive for 12 per cent. Chapter V, but at this point it is interesting to note that high fees. Dental Patiepts' Attitudes (Gainesville: Florida Surveys, 1963), p. 35.
services just as it is for sellers of other products. least in part, because it was too hard for them to get an appointment. ment strategy in their marketing mix. the subject of the next two chapters. of the dentists in the state lived in urban areas. and people coming from families with annual incomes of $7,000 or more. Source: U. S. Department of Commerce, Bureau of the Census, U. (Washington: U. S. Government Printing Office, 1960). portion of young people age 15 to 24 is below the state average. be saved for Chapter V.
distributions of population, income, and dentists would be expected. to scatter according to the distribution of population and income. County (Chicago: American Dental Association, 1963). dentists than any other Florida county. proportions contained in such counties as Pinellas and Palm Beach. lower population per dentist than the 2,094 ratio for Florida. University of Florida, 1963), p. 30.
into three categories and tabulated by county as shown in Table 32.
sonal considerations include such responses as "near the water,"
'$go where your wife wants to go, or go where you want to live." emphasis on this subject in dental schools during recent years. Beach County and only 4 per cent for Brevard and Escambia counties. economic factors than do dentists in the lower income ranges. lower than the 78 per cent for the state. selves in competition for patients than the 29 per cent for Florida. figures although the dentists under consideration are civilians. the dentists with gross incomes of $60,000 or more share this view.